Intuit is reinforcing existing security features that help protect QuickBooks customers’ sensitive information. As a result of this effort, Intuit is delivering an update that impacts third-party applications that connect to QuickBooks using the QuickBooks SDK. A new file specific to a Windows user on a given machine is created on user login that provides access to an SDK app in QuickBooks. The implementation of this update will require customers to re-enter their login-in credentials & authorize application(i.e. QODBC) at QuickBooks. For Example, You have 4 windows users. All of those 4 windows users use QODBC via Microsoft Excel, Access, Crystal or any other applications. You will need to authorize EACH application from all the 4 Windows user. That means you will need to login to the 1st windows user, authorize all the applications that will be using QODBC, then login to 2nd Windows user and authorize all the applications that will be using QODBC. This is because Intuit's LGB file which was common earlier is now changed to new a method and integration information will be stored for each Windows user separately. Above is applicable for a Single machine, Terminal Services(Remote desktop connection) or Workstation(s). You need to follow below steps to reauthorize QODBC for QuickBooks. 1. Login to Windows, Open QuickBooks & login to company file as Admin. 2. 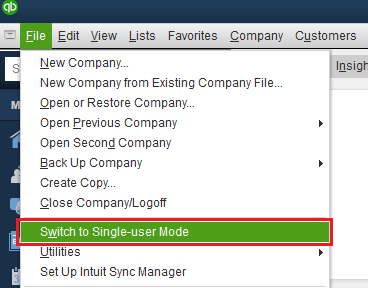 Switch Company File to Single User Mode. 3. Connect using your application. It should pop-up Data Access Certificate on QuickBooks, Please accept the Certificate. QuickBooks issue Certificate is for each application, So you need to accept the certificate for all application which you are using with QuickBooks. 4. You need to log in to each Windows Users who are accessing QuickBooks Data using QODBC. If Windows User/Work Station changed, then you need to reauthorize application using above steps. If the company file has Personally Identifiable Information (PII) in QuickBooks, users will be required to login with a password; the SDK app will only be allowed to connect once the login has been completed for that user. When logging in, customers will be instructed to set up a strong password. Customers should use unique letters and numbers in a password, not basic words that can easily be found online or in the dictionary. Please make sure that you have accepted the certificate for each Windows Users who is accessing QuickBooks Data using QODBC. If Windows User/Work Station changed, then you need to reauthorize application. Is there any way let user Accept certificate once and trust an app, so the app can access to new opened company file automatically. Certificate process is handled by QuickBooks and not by QODBC. QODBC doesn't have control of the QuickBooks certificate process. You need to login to company file as Admin into QuickBooks & accept the certificate. Only Admin privileges user in QuickBooks can accept the certificate & this activity only once per application & Windows User. 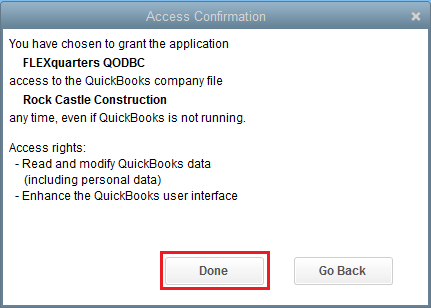 You need to log in for each Windows Users who is accessing QuickBooks Data using QODBC. 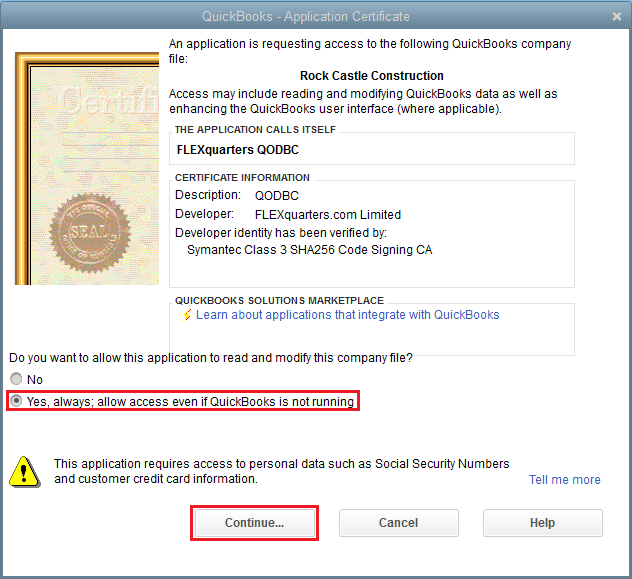 If QuickBooks find that some issue in app certificate, then it may ask for accepting certificate again. I have a process which copies the new version of the quickbook file every month from another server and extracts data from it using QODBC but I need to give access to the driver everytime. Is there some way I can automatically grant permission? I'm sorry to inform you that the automatically grant permission feature is not available through the Intuit SDK so they are not available through QODBC. I've verified that QODBC is connected but when I go to run my access database I get a generic message that access has stopped working.